Do you have stabbing heel pain that rises to greet you in the morning or after a lengthy break or sit? Chances are good that you’ve got a case of plantar fasciitis, a painful condition caused by stretching and tearing in the connective tissues underneath your heel and arch. Although a variety of treatment options may be recommended, one of the most effective methods for many cases of especially tough or recurring plantar fasciitis is custom orthotics. In many individuals, the fundamental source of plantar fasciitis pain is an unstable foundation. Your feet work hard every day to cushion the weight of each step and spread out impact forces evenly, so no one spot gets too overstressed. Unfortunately, not all feet are equally efficient at this task. When foot structure isn’t quite as biomechanically sound as it should be, the weight and force that arches and heels are asked to bear may be magnified past the breaking point. That’s where custom orthotics come in. Just like glasses or contacts allow less-than-perfect eyes to bring the world into sharp focus, custom orthotics enable feet of all shapes and sizes to distribute weight evenly and get the cushioning and support they need for pain-free living. Each one is constructed individually from a mold of your foot, held in a biomechanically-correct position by one of our experts. 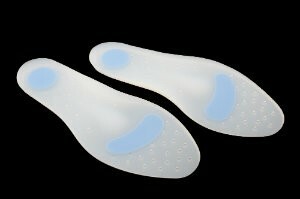 That allows the orthotic to provide much better results than over-the-counter insoles you may have tried in the past, because it “knows” exactly what your foot needs and is built specifically to provide it. Of course, the simple fact that you have plantar fasciitis doesn’t necessarily mean that you need custom orthotics. Plantar fasciitis can arise for a variety of different reasons, and at Martin Foot & Ankle we understand that no two feet are alike and every patient has different needs. Custom orthotics are a common, effective treatment method in many cases, but our team of professionals will always take the time to fully evaluate your condition and help you determine the best course of action, whatever that may be. To schedule an appointment with us, please call (717) 757-3537 today.